At quarter past six in the morning, a taxi delivered us to the train station in Salta, Argentina. It was April, the beginning of autumn, and it was raining. Not a very promising start for a much-anticipated ride on El Tren a las Nubes, the train to the clouds. After we had exchanged vouchers for boarding passes, we found our seats among a full load of passengers from many countries. We sat at an elevation of 1187 meters (approx. 3900 feet). The train left, on time, at 7:05am. The first announcement, in both Spanish and English, was ominous. We were asked to close windows and metal shutters as we passed through an area where people have thrown rocks at the train. There were no rocks that morning and soon we could open the shutters to flat farmlands. Many fields were untilled, a reflection of the current economics of agriculture in Argentina. Occasionally we saw feedlots with sad cattle standing in the rain. Soon we crossed a river with angry, brown waters swelling to the banks and began to ascend from the valley. Also, the rain stopped. We followed the river, crisscrossing several times on some of the twenty-nine bridges of this journey. Outside, thick, wet brush, often choked with purple morning glory, occasionally opened into clearings where crude houses shared the space with goats, cows and chickens. Oddly, a few saguaro cacti poked their spiny arms above this rather damp vista. The wetness quickly disappeared, replaced by dry, sparsely vegetated, land and more cacti. The dominant colours became earthy browns and reds. We had already passed through some of the twenty-one tunnels and had entered the first of the two zig-zags, where the train went forward and backward along short sections of track and rapidly gained elevation. In the coaches, passengers raced from side to side, cameras in hand, trying to catch the best shots of the images unfolding before their eyes. 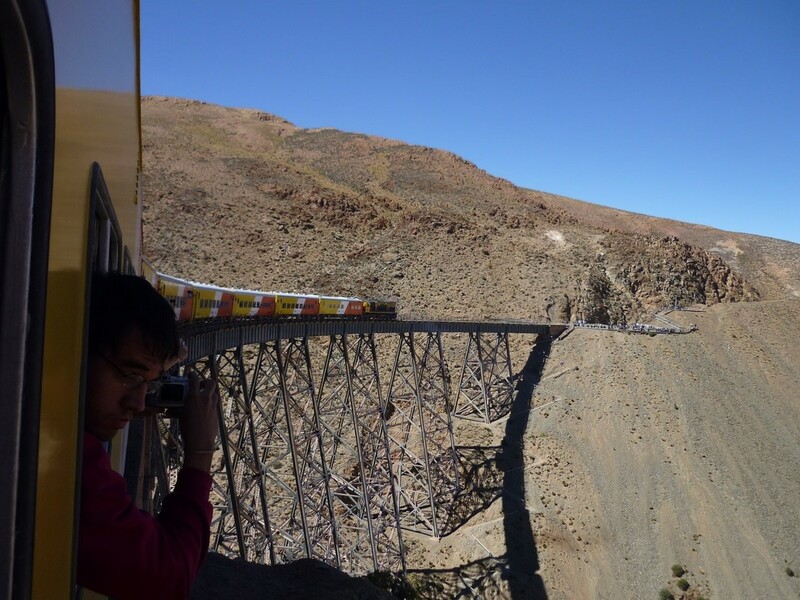 The next bridge spanned a significant gorge and we had our first test of trust that the train would not suddenly lurch off the seemingly precarious tracks. At three thousand meters, with a grand panorama of coloured rocks outside, we began to feel the effects of altitude. Our glossy souvenir magazine had provided a list of symptoms and cautioned against rapid movement and over-eating. The train has a contingency plan that includes on-board nurses and an ambulance which follows the train route along parallel roads. A cabin attendant came by with an Inca-patterned fabric pouch full of coca leaves which are the traditional antidote for soroche, altitude sickness. Few declined the offer. Soon we were talking with wads of chewed coca leaves held between gum and cheek. The remedy seemed to work. As we crossed more bridges and viaducts and many kilometers of track, train windows were now opened on what had become a warm, fresh sunny day. However, we soon learned to close them in the tunnels, where diesel fumes cannot be vented. The longest tunnel, of more than half a kilometer, brought us to the puna, the high mountain area we followed ever upward. Outside was an array of red, brown, green, gold and grey fantasy rock formations. We had spotted many wild burros, and then, our first llamas. Excitement was high. We soon saw dozens more. We had passed several small settlements where Andean native peoples shyly waved at the train. After about six hours, we circled around San Antonio de los Cobres, a borax mining town of nearly six thousand inhabitants. We would make a stop there for a handicraft market on our descent, but we still had some more climbing to do. The last span we crossed was the most spectacular. It is called Viaducto La Polvorilla. It is sixty-three meters high and two hundred twenty-four meters long and stands as the highest tribute to engineer Richard Maury and his construction team who built this incredible railway in an age when only hand tools and dynamite were available for construction. On the other side is an abandoned copper mine, where the diesel engine switches from one end of the train to the other. We were at 4200 meters, just a shade under fourteen thousand feet. The sky was a magnificent blue in the thin air. We made an exhilarating return crossing of the viaduct, with many passengers hanging out the windows, snapping pictures of the trestle shadows on the rocks below. On the far side, the train stopped at a perfectly positioned viewpoint and we could get off for the first time. Locals waited in patient expectation of sales of their handicrafts. Many purchases were made around a flurry of photography. A tethered llama was photographed with dozens of turistas posed beside it. We re-boarded and began our descent. Soon we had again reached the large mining town and made our final stop for a much larger market, set up on the outskirts of the town. It was a fine opportunity to buy Andean crafts at excellent prices. On the return journey, with the encouragement of the train staff, most passengers switched sides of the train to enjoy the views they had only glimpsed on the way up. It helped make the trip back interesting. Long before we left the mountains, day turned to dusk and then dark. We arrived back in Salta a few minutes before 11pm, exhausted but sated from a remarkable day.